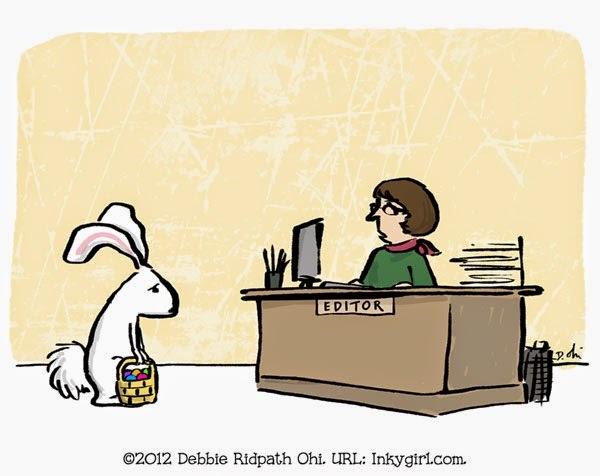 Do you like Easter egg hunts? No, not the kind with puzzled toddlers and woven baskets and brightly colored candy and hardboiled eggs. The type of Easter egg in question is a hidden message or other feature in any piece of content or even a computer or software program. A variation on this theme is naming or describing someone or something in a story to give readers a clue about a plot element. Writers employ this device all the time, merely by giving a character an evocative name. The moniker of Ebenezer Scrooge, for example, thanks to its grating, discordant qualities, does not inspire a reader to visualize a kindly, generous figure (though names can be — or, in this case, can become — deceiving). Speaking of eggs, an anecdote about Christopher Columbus features him countering the claim that anyone else could have accomplished his feat of discovery by challenging others to stand an egg on end. When they fail to do so, he taps the egg on a table, breaking the end, and sets it upright on its now-flattened base. (A similar, possibly apocryphal story predates this incident, which itself may or may not be historical.) This analog to the Gordian knot — or a reference to the Gordian knot itself, part of the lore of Alexander the Great — could allude to an offbeat solution to a problem. This is the name of a fictional spaceship in the Star Trek universe, the subject of a computer simulation that tests a prospective Starfleet officer’s character by presenting a scenario in which the vessel is disabled in forbidden territory. The exercise, similar in theme to the riddles of the Egg of Columbus and the Gordian knot, is ostensibly a no-win situation: The simulation program cheats so that the test subject always loses, thus guaranteeing that the focus will be not only on the person’s approach to solving the problem but also their reaction to the failure. However, several Star Trek films, series episodes, and novels refer to efforts to subvert the test. In your story, a ship or person so labeled — perhaps with the names inverted — will tease knowing readers with the understanding that some similar stratagem is in the offing. At least one researcher suspects that Doyle was a conspirator in the Piltdown Man hoax, in which a fossil skull found in England in the early twentieth century was believed to be the fabled missing link between apes and humans. Doyle became an ardent spiritualist after the deaths of his wife, a son, and other close family members, and argued for the existence of fairies. He was a friend of escape artist Harry Houdini until the latter’s antispiritualism crusade, during which Houdini debunked fraudulent psychics and mediums, led to an estrangement. Doyle also created another legendary character, Professor Edward Challenger, hero of The Lost World and other adventures. This post does not suggest using these specific examples; my hope is that they will inspire you to cook up some of your own Easter eggs purchased in your store of knowledge and served in a story in the appropriate genre.